A conservatory adds an extra room to your home; a room in which you can enjoy a sense of the outdoors, without actually being outdoors – if the external temperature is too cold, or too hot, for example – whether you want to eat, enjoy your garden, or just relax, in comfortable surroundings. In cold weather, a conservatory effectively acts as a "buffer zone" between the interior and exterior of your home, maintaining the interior temperature, and reducing your energy costs. Conservatories come in many different designs, all of which can enhance your lifestyle, as well as increasing the value of your home. Straight, or curved, eave conservatories, for example, are very popular, and can have aluminium frames, or aluminium frames with wooden interiors, and a solid, or high performance glass, insulated roof. Cathedral style conservatories, with vaulted ceilings, and slanting roofs, and Victorian, or Georgian, designs, with multiple glass panels merging into a single roof beam, similarly combine modern comfort, and energy efficiency, with traditional, classic, style. A conservatory is, of course, not a conservatory without appropriate furniture and blinds. 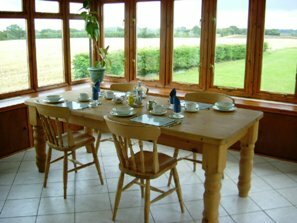 The furniture you choose for a conservatory depends, largely, on the purpose for which it is to be used. You may, for example, to turn your conservatory into an enclosed patio, or dining area, in which case comfortable sofas and chairs, shelves, or a central dining table, and chairs may be appropriate. A spa, or recreation area, with soft carpets, potted plants and perfumed candles is another possibility, and you are really limited only by your imagination. Blinds, typically of the pinoleum, pleated, or roller type, add finishing touches to a conservatory, as well as, of course, allowing you to regulate the amount of sunlight that enters the room. Pinoleum blinds, for example, are constructed from woven strips of wood, and admit diffuse sunlight through the gaps between the strips. Pleated or roller blinds are available in a wide range of colours and fabrics – some with reflective properties, which help to maintain a comfortable temperature in your conservatory – to suit any interior décor that you may choose. Underfloor heating in a conservatory not only raises the temperature of the tiles, or other floor covering, so that they are warm and comfortable to walk on, but also radiates heat into the space above. This means that it can contribute to the overall heating of a conservatory without the need for traditional radiators, or free-standing heaters. Electric heating cables, or mats – with outputs up to 200W/m2, and therefore suitable for areas of high heat loss – can easily be installed beneath a conservatory floor, by a builder, a tiler, or a competent DIY enthusiast.